Happy August! August always begins my favorite time of year because it kicks off school and not one but two birthday weekends. Stop by the forums to share and discuss about how you celebrate birthdays in your house. With the fall season now fast approaching, we turn to our new theme - Unmet Expectations. This month women will be sharing about the moments their well made plans took a sudden different direction and their high hoped dreams were thwarted. We kick off our series with Rebekah and Vanessa share their unmet expectation stories from their college-age viewpoints. Both stories are incredibly heartfelt and emotional from two beautiful women who were derailed by unforeseen events. 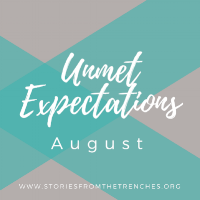 This month come join our specific forum topic on Unmet Expectations where you can engage and discuss in how you struggled and overcame your own changed plans or thwarted dreams. We are currently looking for women to share their trench stories for September series - Mosiac - a tapestry of trench stories. September will not be theme specific as we hope to post a wide variety of shared stories. You can get started on the Submit a Story page of the website or send me an email. We have several volunteer positions open with the SFTT team. Check out if your skills and talent would be a good fit on our volunteer page. Have you ever felt like your life suddenly feels like you are being shaken up in a snow globe? This past week has felt exactly like that for me. Several major roads in my life are about to take major turns. Roads that I thought were certain are now not so much. This leaves me anxious since I don't feel like I have full control over what happens next and I'm definitely not sure what new road I'm about to enter. The control freak in me is freaking out as my new zen attitude sighs with "all will work out just fine". Have you ever felt like you entered a snow globe? How did you recover?